As a counterpart, Indonesia and Taiwan have a beneficial economic relation. In 2015, Indonesia and Taiwan had 8,4 trillion USD total trade, while the total investment reached 1,1 million USD. Nevertheless, the development of Indonesia-Taiwan cooperation is relatively more delayed compare to other neighbor countries, such as Singapore. In 2013, the cooperation between Taiwan-Singapore, ASTEP, came into force and became the first economic cooperation arrangement between Taiwan and Southeast Asia country while the cooperation between Indonesia-Taiwan on Morotai Development Project remained stagnant since 2013. 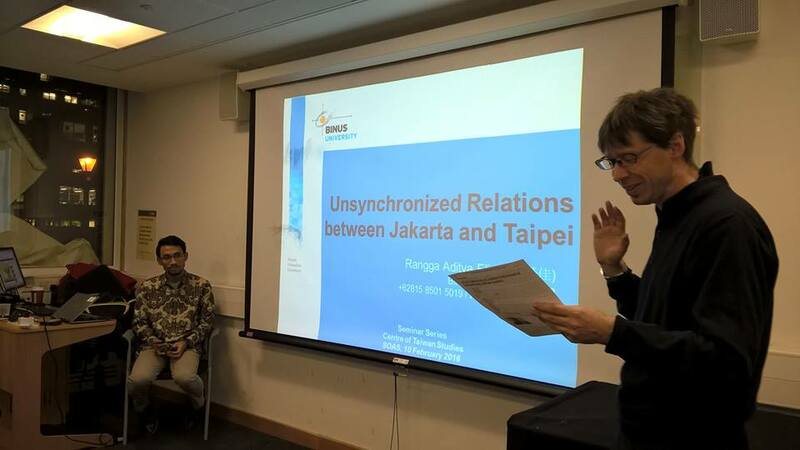 During his talk in Seminar Series at School of Oriental and African Studies, University of London on February 10th 2016, Rangga Aditya, a lecturer from IR Department Binus University, argued that the unsynchronized relation between the representative institutions of both respective parties has caused the stagnant cooperation between Indonesia and Taiwan. Currently, TETO and IETO, known as de-facto institution (DFI) as well, have unsynchronized goal, understanding and effort of each institution. This is due to the normative basis differences issued by Indonesian government which became the basis of IETO establishment in 1994. Thus, not all of the existing cooperation involves DFI as the negotiator and implementer, whereas the role of DFI is crucial in order to have a sustainable cooperation. Up to now, the cooperation in the recruitment, placement and protection of Indonesian Overseas Workers in Taiwan is the only sustainable cooperation between Indonesia and Taiwan as it involves DFI at every stage of the cooperation process (signature, negotiation, and implementation). Rangga further argued that understanding the development of cross-strait issuesby Indonesian government is highly crucial in order to have a synchronized interaction between the DFI, which may lead to a sustainable cooperation that bring welfare to both parties.